The Duchess of Cambridge shared this tip to the First Lady. The organic gel is believed to reduce muscle contractions like Botox and it was worth £43 ($54). It appeared to be effective because the wife of President Obama still looked youthful until now. The beauty secret was revealed by First Lady’s makeup artist Carl Ray. 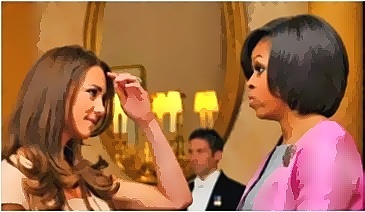 Although it was uncertain when the brunette beauty passed on her skincare secret to Michelle Obama, the two were introduced to each other at a reception at Buckingham Palace in 2011, shortly after the royal wedding. And they met each other again during a private dinner at Kensington Palace in April this year. Meanwhile, Duchess Kate was a fan of natural skincare. And Michelle also kept her skincare regime to be simple and natural. She depended on exercise, plenty of water, a good diet and sleep.